Byzantium is an exploration of symbolic folklore and horror-fantasy from Oscar-winner Neil Jordan, the filmmaker behind The Company of Wolves, Interview with the Vampire, In Dreams and Ondine. The film's still waiting to receive an official U.S. release date; however, in the meantime, an international trailer has released online. Oscar-nominee Saoirse Ronan (Hanna, The Host) and Gemma Arterton (Hansel & Gretel: Witch Hunters) headline as Eleanor and Clara Webb, two mystery women who appear to be sisters when they arrive seeking refuge at a deteriorating coastal resort. Once Eleanor befriends Frank (Caleb Landry Jones, X-Men: First Class), she reveals the truth: the pair are centuries-old vampires, with a history of surviving on human blood that's about to catch up on them. As far as trailer footage is concerned: Byzantium is visually-lush and captures the chilling, yet gorgeous, atmosphere of Ireland's coastal areas - where the majority of filming took place (though, the actual setting is the English seaside) - through excellent cinematography from Sean Bobbitt (Shame, The Place Beyond the Pines). Unfolding events possess a sense of melancholy similar to Jordan's work on Ondine, yet it's more enthralling and creepy, thanks to those vampire story elements. Scripting duties were handled by Moira Buffini, who previously adapted the graphic novel Tamara Drewe (also starring Arterton) and penned director Cary Fukunaga's especially gloomy and Gothic take on Jane Eyre. Byzantium seems to be tackling familiar themes of vampire lore about the high price of immortality, but also ideas about the enduring nature of misogyny throughout history (as explored through both the real world and vampire society). That particular quality sets Jordan's film apart from other recent additions to the genre - and makes this vampire picture seem all the more intriguing, by comparison. 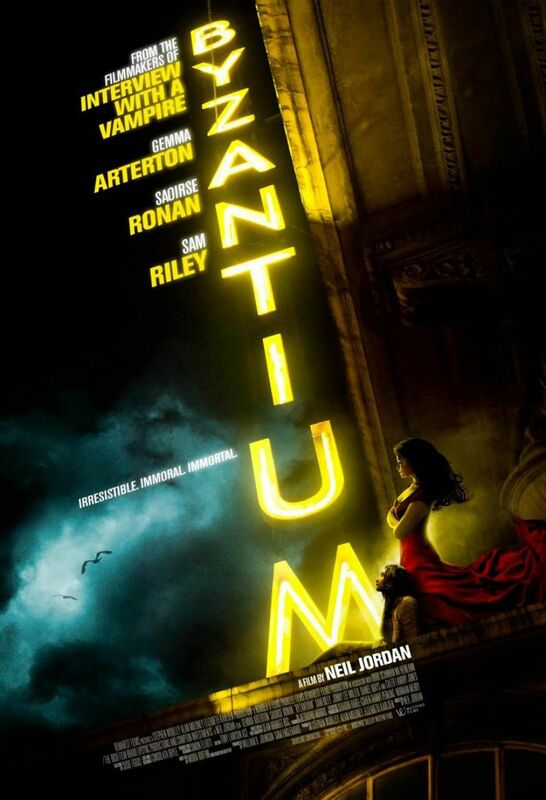 The Byzantium supporting cast includes Jonny Lee Miller (Elementary), Sam Riley (On the Road) and Tom Hollander (Hanna). Meanwhile, the film's production design was handled by Emmy-nominee Simon Elliott (The Iron Lady) and score composed by Oscar-nominee Javier Navarrete (The Devil's Backbone, Pan's Labyrinth). We will let you know when Byzantium secures an official U.S. release date.